The Western Journal of Emergency Medicine (WestJEM) originally was the California Journal of Emergency Medicine (CalJEM). Founded in July 2000 by Editor-in-Chief Dr. Robert W. Derlet from the University of California, Davis School of Medicine, CalJEM started as a 4-8 page newsletter distributed quarterly to 200 members of the California Chapter of the American Academy of Emergency Medicine (Cal/AAEM). In January of 2001 Cal/AAEM President Dr. Antoine Kazzi from the University of California, Irvine (UCI) assumed the role of Managing Editor, and in July 2002 Dr. Robert Rodriguez, at the time from Alameda County Medical Center Emergency Medicine Residency Program, assumed the role of Editor-in-Chief. Dr. Warren Wiechmann, a medical student at the time, began posting the journal online at www.cajem.org. Over the years CalJEM expanded in content and scope into a print journal distributed to over 2500 individuals in California with support from Cal/AAEM and the Emergency Department (ED) at the UCI School of Medicine. After Dr. Kazzi became the interim chair of the ED at the American University of Beirut, Dr. Shahram Lotfipour from UCI accepted the managing editor position in January 2006. That same month the journal’s physical look and quality were upgraded, and in March 2006 color was added. Dr. Steve Gabaeff, the President of CAL/AAEM in 2006, started the Academic Task Force as a collaborative effort between the California academic departments, divisions and sections of emergency medicine with the goal of bringing the academic content of the journal to a higher level. Dr. Lotfipour with support from staff at UCI initiated online placement of the journal at eScholarship, an open-access repository that provided publishing services and a journal management system, which provided an efficient platform for the editorial review process. In February 2007 Dr. Rodriguez stepped down and Dr. Mark Langdorf, chair of the ED at UCI assumed the Editor-in Chief position. With a new vision and mission in mind Dr. Langdorf set to transform CalJEM into a more robust academic and professional journal. With the collaboration of Senior Associate Editor Dr. Sean Henderson, Vice Chair of the ED at the University of Southern California, the academic rigor of the journal was enhancing. To make the transition into a full-fledged academic journal, to expand the scope and content beyond emergency physicians in California and to be the premier open-access emergency medicine journal in the Western HemisphereCalJEM was transformed into WestJEM in August 2007. The metamorphosis was ambitious, yet over a short period the journal grew exponentially. WestJEM was promoted and visible at every emergency medicine conference, and the word spread across the U.S. and the World about this open access journal, free and available to anyone with an internet connection. In just two years the submissions to the journal grew from 11 per month to 22. Due to the journal’s expansion the financial burden became heavier and more stable footing was needed.WestJEM approached the California chapter of the American College of Emergency Physicians (Cal/ACEP) for sponsorship and brokered and agreement to name WestJEM the official journal of the Cal/ACEP, with the addition of Cal/ACEP’s logo on the journal and have Cal/ACEP become apart of the advisory board. In July 2009 after many drafts, emails, and conference calls, the agreement was signed and executed. Beyond its significance for WestJEM’s growth and prestige, the agreement marked a historical moment for two competing emergency medicine organizations with differing philosophies, Cal/AAEM and Cal/ACEP, to come together in support of emergency medicine as a whole. A year later, the same approach was made to the American College of Osteopathic Emergency Physicians (ACOEP). With WestJEM’s perpetual growth more support was needed to sustain its viability. Again after many conferences calls, drafts and negotiation, ACOEP came on board as the first national emergency medicine organization to support the journal. This agreement represented more than just the emergency medicine community, but all of medicine. Never has there been a journal with both an osteopathic and allopathic organization as their official sponsors. Historic strides were made in bringing together emergency medicine, osteopathic and allopathic alike. With WestJEM’s reach spanning the U.S. and much of the world and the marked indexing of WestJEM in PubMed Central, submissions increased to a point that the current senior editors and section editors were inundated with articles to edit and decide on. WestJEM needed a new senior editor who could make academic decisions to further the journal’s prestige and acclaim. Having demonstrated dedication and commitment toWestJEM, Dr. Rick McPheeters, chair of the ED at Kern Medical Center, assumed the role of Associate Editor. With a growing editorial board, section editors, staff, reviewers and senior editors the journal published 130 articles in the 2010-2011 academic year. Over 10 years since its inception, CalJEM/WestJEM and CAL/AAEM have grown immensely. WestJEM has moved to an international stage drawing submissions from 200 countries and is receiving well over 300 submissions and hundreds of thousands of online views per year. Cal/AAEM has expanded its membership to over 600 members and is hosting conferences across the globe. The successful collaboration between Cal/AAEM and WestJEM highlights these positive achievements the two groups have accomplished both independently and together with the continual support from each other. 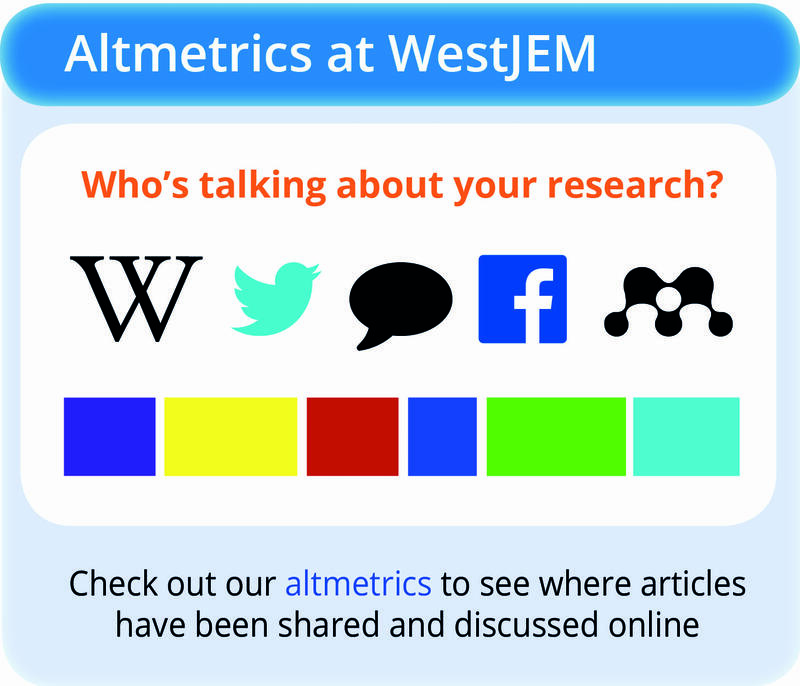 WestJEM is now indexed in PubMed, PubMed Central, Scopus, CINAHL, and the Directory of Open Access Journals. Our most immediate goal is to increase submissions to the Journal and to obtain MEDLINE indexing. It would be too easy to allow a publisher to take over the journal, charge subscription and ridWestJEM of the unique quality of being open access. But WestJEM full-heartedly believes in the free exchange of ideas and that scholarly work should be available to all without impediment. With the continual support of our excellent editorial staff, our section editors, editorial board, reviewers, many sponsors including, emergency departments throughout the United States, and our major society sponsors, Cal/AAEM and now Cal/ACEP and ACOEP, the growth for all involved can only be greater.